Floodscaused by heavy monsoon rains have not receded yet. This flood happened in the wake of another major flood just one year ago, and there is a feeling that the Government was not adequately prepared.There are even calls for the resignation of the Minister for Disaster Management. Resignation of ministers will not solve the problem. Disaster management is not something one ministry can do. In my opinion, we don’t really need a ministry for disaster management. But in Sri Lanka or in most developing countries, governing requires redundant ministries to keep various faction and/or individuals happy. I am happy to look the other way and not complain about cost of such redundancies, if the President and the Prime Minister find ways for these ministries to coordinate, particularly in cases like managing disasters or solid waste disposal, both of which affect people intimately and mean life and death situations for some. Thefoot soldiers of disaster response are the DivisionalSecretaries who are best able to coordinate warning and reliefefforts, local authorities who have the physical resources like tractor-trailers and other equipment, Grama Niladaris who can provide village level coordination and local volunteers or local volunteers of organisations like Sarvodaya. Armed forces too always come forth with their support. Ministers may get photo ops but local action is what gets the jobs done. National agencies have a coordinative role to play, but we need to carefully scrutinisethe functions of the national organisationsto see whether they are structured properly for supporting these local efforts. In an ideal world, an implementing arm which should preferably located under one Ministry responsible for all ‘home affairs’ including decentralised functions of the central government carried out through District Secretariats and Divisional Secretariats. Unfortunately agencies which should be together are dispersed like candy to children, beginning with 50 cabinet portfolios and state ministries and deputy minsters in each. In this column I argue for a re-empowering of the National Council for Disaster Management. In September 2015, in the euphoria of a change in government, I wrote that the proposed cabinet though big has possibility of organising itself under 16 broad areas to be effective. I identified 16 core portfolios using the cabinets of USA and Singapore as benchmarks and organised the Ministries under that core of sixteen. Home affairs was one such core portfolio. In the present Cabinet, the home affairs related agencies are distributed across no less than five ministries –Internal Affairs, Home Affairs, Public Administration, Local Government and Provincial Councils, and Disaster Management. The table liststhe agencies as assigned by gazetteNo. 1933/13 of September 21, 2015, to the five different ministries.The Ministry of Disaster Management, for example, has the Department of Meteorology and the National Building Research Organizationwith technical capacity for disaster warning and three other organisations with policy making and implementation responsibilities. Of the latter three policy and/or implementing organisations, the National Disaster Management Council looks important on paper but there is no evidence of activities in-between-disasters by that council. National Council for Disaster Management in name only? 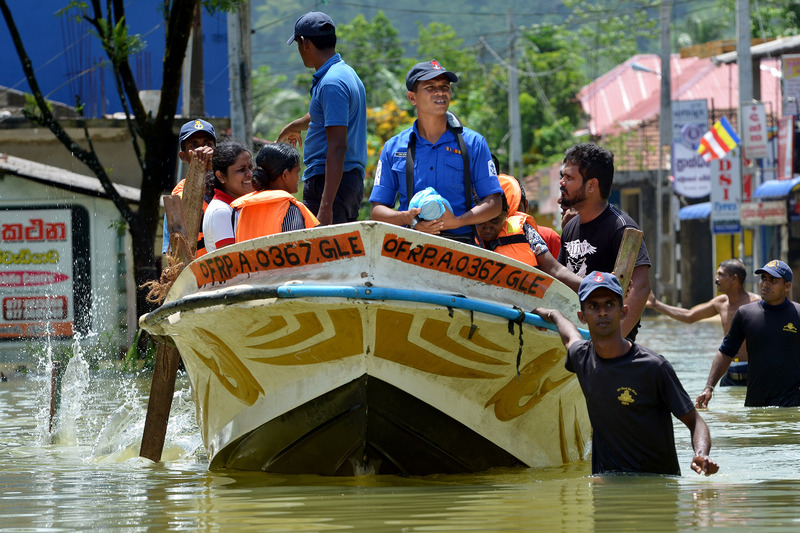 The website for the National Council for Disaster Management (NCDM) claims to be the supreme body for disaster management in Sri Lanka under the Sri Lanka Disaster Management Act No. 13 of 2005. The President is the Chairperson of the National Council and the Prime Minister is the Vice-Chairman, and over 20 ministries along with Chief minsters of provincial councils are listed as members. The list of ministries given on the websiteis an old list left over from the Rajapaksa regime and the site does not seem to have been updatedsince 2015. The Disaster Management Centre announced the other day that the Council met to make decisions, but is that all we expect of such a council? In contrast, the National Disaster Management Authority (NDMA) of India is a tight organisation which serves as the Council and Agency both.The Ex-officio Chairman of the board of the agency is Prime Minister and he is supported with up to seven technocrats with expertise in areas such as, planning, infrastructure management, communications, meteorology and natural sciences. The agency is housed in the Ministry of Home Affairs and is responsible for framing policies, laying down guidelines and best-practices and coordinating with the State Disaster Management Authorities (SDMAs) to ensure a holistic and distributed approach to disaster management. The day-to-day management of the agency is overseen by the office of the Vice Chair who is a senior politician.The structuring of Sri Lankan council with its unmanageable number of ex-offcio members should be reconsidered in light of this much tighter Indian counterpart. In the final analysis, we need to go beyond blaming ministers, but look at the structural limitations of their portfolios. Ideally,we would have a maximum of two home affairs-related ministries, and threeto four current ministerswould resign insisting that the President amalgamates the ministries as one or two home affairs ministries, but that is not going to happen. In the current political realities what we need is a more effective national council chaired by Prime Minister or President and manned by a few critical ministers and supported by team of professionals. Such a council cannot stop torrential rains or avoid any disaster-related death, but it can set realistic targets for performance. For solid waste management too we would need a similar council with performance targets. More on that next time.